This is our Cream of the Crop, our Belgian Endive Soup. | Leasa's Place. This is our Cream of the Crop, our Belgian Endive Soup. 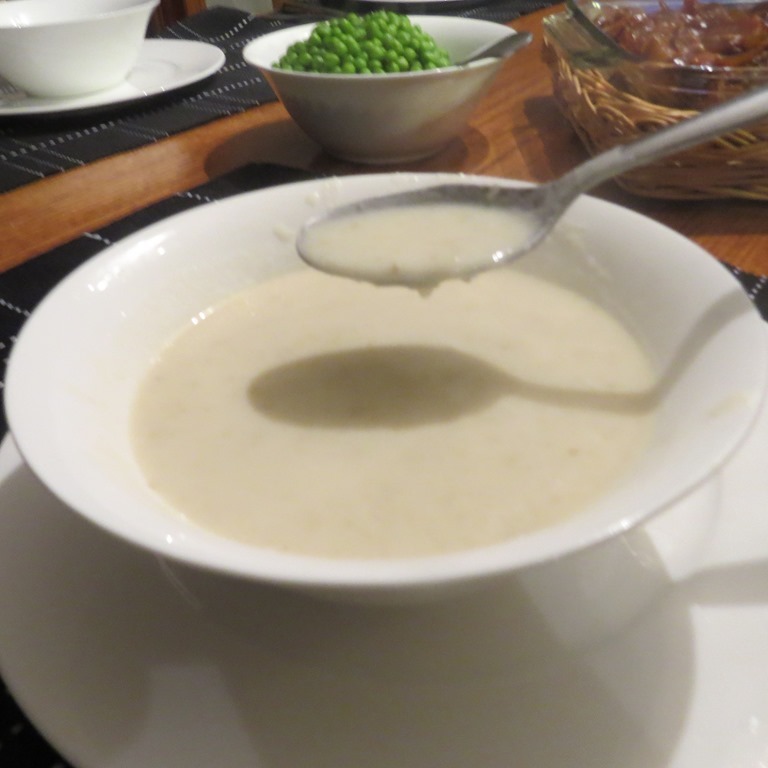 This is one of our favourite, if not, our very favourite soup ever. The flavour is incredible and so unique. I have yet to find anyone who didn’t love it. Remove core and chop fine, 3 to 4 cones of Belgian Endive. Chop fine one medium sized onion and 3 to 4 cloves of garlic. In a deep soup pot add two generous tablespoons unsalted butter, sauté the Belgian Endive, onion and garlic, stirring frequently. Be careful not to burn. About 4 minutes. Chop 3 large or 4 small peeled potatoes into small chunks. Add to the soup pot, these potatoes and 3 cups of chicken broth. Simmer until potatoes are nice and soft, about 20 minutes. Add the blended mix back to the pot. Add 1 cup milk and 1 cup heavy cream. Warm gently and blend…add salt to taste and pepper to taste ( prefer white pepper). ENJOY!!!!! ← Best White Fish Dinner Ever! I wish I would have remembered to send you home with our Belgian endive the other day send me a message if u have any questions. Just visiting your blog again and realized I didn’t tell you how it went. It was so easy to make and absolutely delicious! I didn’t realize Belgian Endive had such a unique flavour. I couldn’t bring myself to use the heavy cream and instead, used skim milk and it was still so smooth and creamy. I will definitely make this again! Hi Tony, thank you for visiting my blog. Yes we do sell Belgian Endive seconds on the farm. We are open Mon-Thurs, 9-5, closed for lunch 12 to 1230. Thank you. Would like to know also what is the price difference between n1. And seconds. And where can I find second in Richmond Hill or Newmarket ‎.thanks..for soup second are just fine..
Hi Tony, as we grow the Belgian Endive all year around, we do not have drive in sales Saturday and Sunday otherwise that would be a whole lot of weekends to work! But, once the asparagus comes on, for that six weeks we will be here for sales Saturdays and Sundays until 4 pm. We expect the white asparagus to start this week or next week for sure. Thank you Tony for visiting our website and my blog! when are the asparagus for sale? Hi! I’m sorry, I didn’t get your message! We’ve been so busy outside that this is the first I’ve been to my blog. Right now, I have lots of #1 thins, #2s and soup but short on #1 thicks until next week. You can place an order on my answering machine and if there is any issues with it I’ll call you, if you don’t hear from me, it’s all good. You can also email me at: jpsi@xplornet.com Thank you for your continued support!! I’m making Belgian Endive Soup for dinner this evening. Looking forward to trying it! Hi Leasa when is the time for asparagus? We are cutting now! Thanks!